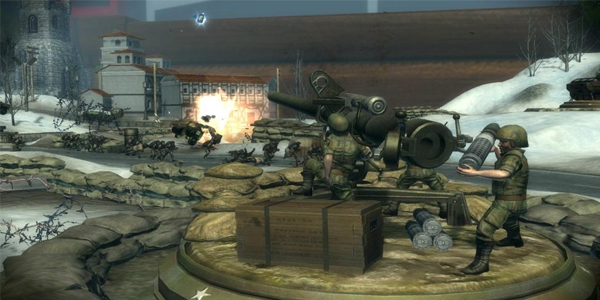 Toy Soldiers: Cold War was developed by Signal Studios and published by Microsoft. It was released on August 17, 2011 as part of Summer of Arcade for 1200MSP. A copy was provided for review purposes. About two years ago, Signal Studios released the original Toy Soldiers on Xbox Love Arcade and it has since been one of the top selling XBLA games to date. With that success, a sequel was inevitable. Now, two years later, Toy Soldiers: Cold War sets out to improve on a formula that was pretty damn good to begin with. Toy Soldiers: Cold War is an action tower defense game where you play as an American army of toy soldiers who are trying to keep the Soviet forces from invading their toy box. Aside from basic tower defense elements, Toy Soldiers: Cold War also contains many user-controlled vehicles, special abilities and the option to manually use each tower/emplacement. These additions make Toy Soldiers: Cold War a hectic, action-packed game that allows gamers to play it however they please. For players of the original Toy Soldiers, this is no surprise. But if you’re a classic tower defense gamer, you better prepare for an incredible change of pace that adds up to countless hours of fun. Barrages – When you achieve a high enough multiplier in Toy Soldiers: Cold War, you earn a random barrage. 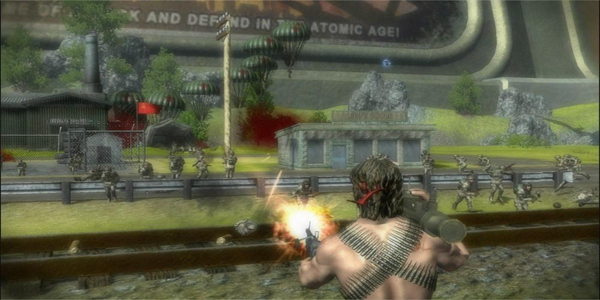 The barrage can be anything from air strikes to nukes to a playable soldier that resembles 80’s action star Rambo. Press the Y button to use your barrage and prepare to be overwhelmed with power. These power-ups are incredibly over powered and are an absolute blast to use. It’s very satisfying taking your commando Rambo character into the heart of an enemy tank wave and destroying anything within sight in a few short seconds. Customizable controls – One thing you may notice as soon as you start playing Toy Soldiers: Cold War is that the default controls may seem a bit strange. If that is the case, then you’ll likely be pleasantly surprised when you take a look at the options and see how customizable the controls are. Each scenario in the game has its own control scheme. Whether it’s driving a tank or operating an emplacement, it’s all about how the individual gamer wants to control each object and this is a truly great feature. 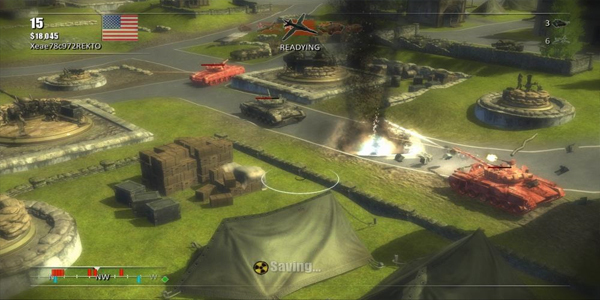 Mini games – There are six unique mini games included in Toy Soldiers: Cold War that are all very addicting. Each mini game will only last a minute or two at the most, making hi-scores depend heavily on precise accuracy. There is very little time, so in return there is very little room for error. The display of friend leaderboards at the end of each attempt will provide that “one more game” mentality, causing these bite-sized moments to take up large chunks of time. Golden arcades – We see collectables done wrong in most games these days, but Toy Soldiers: Cold War is a great example of how collectables can still be fun. Each level contains one hidden golden arcade machine, and in most cases they are very well hidden. Very creative uses of the backgrounds and environments make finding these golden arcades an enjoyable side objective as opposed to the uninspiring time waster that most collectables represent. Power of the player – Placing emplacements and hoping for the best isn’t the best tactical solution to each level, but it will still most likely get the job done. But the difference between an AI operated emplacement and a human operated emplacement is like the difference between night and day. You couldn’t ask for more control of this game, and manual control is greatly rewarded. Some emplacements even allow you to control the speed and aim of missiles after they are fired. Add the barrages and a variety of vehicles and you have a game that can be played in a magnitude of ways. The little things – When you create a game that is set in the 80’s, you have a wide range of items that you can try to cleverly include in your game. Signal Studios took that thought and ran with it. Throughout the game, you notice cassette tapes, 5.25 inch floppy discs, and even a Zack Morris style cell phone scattered throughout the environments. If you are a child of the 80’s, prepare for a great game and a trip down memory lane. The details in each environment are incredible and we highly recommend exploring each map. Versus mode – A competitive versus mode is included in Toy Soldiers: Cold War, but it really isn’t worth your time. Versus mode plays out with each player trying to earn money and push offensive waves through a small map into each other’s toy box. The problem is that the commando character is free for each player and he is completely overpowered for a multiplayer game. He will destroy all enemies with ease, turning every match into a commando vs. commando battle. The single player and co-op campaigns are clearly where this title shines. Artillery micromanagement – Every emplacement in Toy Soldiers: Cold War has an attack circle around it except the artillery emplacements. Instead, the artillery emplacements have a vision cone and limited maneuverability from side to side. None of the emplacements with a circular attack range need to be micromanaged, but you’ll constantly notice that artillery emplacements aren’t shooting at enemies because they are slightly off to the sides of their range. It’s hard to remember to micromanage one emplacement when all other emplacements turn around and move on their own. This was annoying in the original Toy Soldiers and it’s still annoying in Toy Soldiers: Cold War. We would like to see a patch that would make artillery units turn around on their own, but that’s probably wishful thinking. 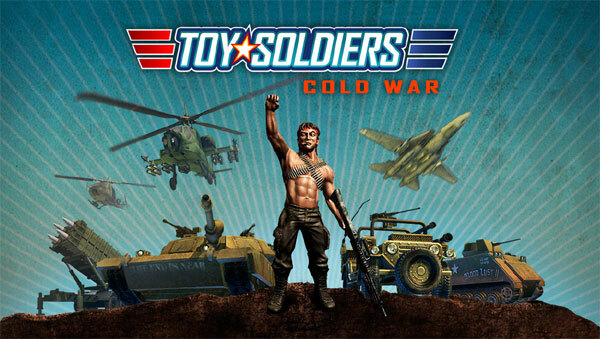 Toy Soldiers: Cold War is an amazing game and is easily considerable for the XBLA game of the year. Solid controls, encouragement of many play-styles, tons of content and a great attention to detail make this game a must buy for any gamer. Signal Studios has taken everything that worked in the original Toy Soldiers and improved upon it in every way imaginable.